Clinic Synopsis: Being a member of Art Blakey and the Jazz Messengers was at the highest of the Jazz learning curve. Join this clinic and discussion on how Art Blakey “got the most out of his Messengers." Clinician Biographical Information In 1992 Jackson made his recording debut with Me and Mr. Jones, featuring James Williams, Christian McBride and master drummer and NEA Jazz Master Elvin Jones. Jackson also recorded six projects for Blue Note Records featuring collaborations with Betty Carter, Dianne Reeves, Cassandra Wilson, Kenny Garrett, Jacky Terrason, John Medeski and Vernon Reid. Among his later recordings for Palmetto Records, Javon explored funk based jazz, incorporating the sounds of Fred Wesley, Dr. Lonnie Smith, Lenny White, Mark Whitfield and others. Javon’s current musical group, The Javon Jackson Band, blends many styles including jazz, funk, R&B and rock. In 2012, Jackson released two self produced recordings, Lucky 13 and Javon Jackson and WE FOUR, Celebrating John Coltrane. These CDs marked his return to acoustic jazz. For Lucky 13, Javon covers music by Stevie Wonder as well as newly composed original material and is joined by a special guest, Les McCann, for three selections. 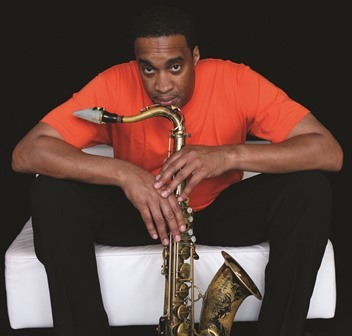 Javon Jackson and WE FOUR, Celebrating John Coltrane, is a tribute to the iconic saxophonist, composer and bandleader. The release is highlighted by an appearance by NEA Jazz Master Jimmy Cobb, drummer for both Coltrane and Miles Davis. In live performances, The Javon Jackson Band is joined by special guest Les McCann, the iconic soul jazz pianist, vocalist and composer. Known as one of the godfathers of soul jazz, Les is recognized as a founding force for the genre known as funky jazz established in the mid 1960’s. In 2010, Javon was commissioned by the Syracuse International Film Festival to compose a full-length score for the Alfred Hitchcock film, The Lodger, a silent movie based on the hunt for Jack the Ripper. The original score had its debut at the festival, performed live by Jackson at the film's screening on October 2010. In 2012, Javon was the recipient of the prestigious Benny Golson Award from Howard University in Washington, DC, for recognition of legendary excellence in jazz. In addition to his performance schedule, Javon Jackson is a highly sought after jazz educator, conducting clinics and lectures at universities throughout the United States and abroad. He served as Assistant Professor of Jazz at Long Island University (NY)1996-1998, and in the Conservatory of Music at Purchase College (NY) 1999-2007. In 2013, Javon accepted the position of Director of the Jackie McLean Institute at the University of Hartford. Also, Javon currently serves as a Jazz Panelist for the National Foundation for Advancement in the Arts. He is also a member of JEN (Jazz Education Network) and lends support as JENerations Jazz Festival Artist and Clinician Coordinator. Jackson has a Bachelor in Music from the Berklee College of Music (Boston, MA) and a Master of Music from State University of New York College at Purchase.